Will PS3 connectivity make this a mid-range media marvel? The Sony Ericsson Aino is the phone that finally brings PS3 connectivity to a mobile - bringing the best of Sony's brands to beat the multimedia prowess of the iPhone and Samsung i8910HD. It's a mid-range effort, following just behind the Sony Ericsson Satio in the recent slew of releases from the brand, but it still tries to pack a wealth of functionality into its chassis. The main talking point is the PS3 connectivity - but don't get too excited as it's not the PSP phone we've all been waiting for, more a device to make use of the considerable multimedia prowess of the PS3. Beyond that, the phone is similar to the Sony Ericsson W995 in terms of specs - 8GB memory card, BBC iPlayer support, standard SE interface and so on. But the shape is entirely different - it's a long device with a 3-inch screen and a slide out physical keyboard. Sadly it's only widescreen QVGA, meaning it won't give the best resolution for watching movies or viewing web pages. The slide action is solid with a pleasant feeling both up and down - given that the likes of the Palm Pre and the Motorola Dext haven't managed to achieve such a thing with recent high-end devices, this is good to see. The solid black chassis is a lot less button-full than the Satio, with a camera shutter and a volume/zoom rocker switch on the right-hand side. The left merely houses the standard Sony Ericsson port for power, USB and headphones (sadly no 3.5mm headphone jack here, despite SE debuting it on the W995). The top of the phone hides the lock switch for when the phone slider is shut - because this phone has an odd double life. 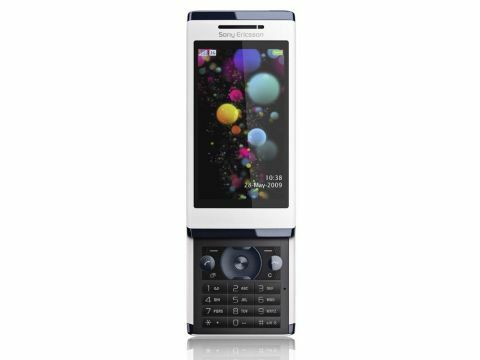 By day/when slid up, it's a meek Sony Ericsson phone with a slightly long screen - physical keyboard and the normal interface. But by night/when closed, it morphs into a multimedia marvel, with a touchscreen activated by a slide up arrow. It's an odd scenario, and one we'll go into later in the review. The physical keyboard is well laid out, with the important buttons all necessary. We're enjoying the rubberised and compact yet easy-to-hit layout, with the two softkeys flanking a circular D-pad and enter button, as well as a clear and running applications/notifications key below. The rear of the phone houses the camera, an 8.1MP effort, with a single LED flash for both video and photography. The battery is hidden below the snap on cover, which is a little tricky to replace and requires a user to push it harder than they'd probably like - we felt like we were going to break it. The SIM and battery compartments are well laid-out, with the microSD slot at the top easy to use and the battery simple to remove to access the SIM card. The design of the phone is interesting - with the lock key in a little bit of a hard to reach place and the phone not quite sitting as snugly in the hand as the Sony Ericsson W995. However, it feels solid and is impressive enough for the market SE is likely to be aiming for with it. There's the usual fodder in the Sony Ericsson box for the Aino, with a couple of notable exceptions. There's, of course, the USB lead and charger (both proprietary) and some quick start literature. It's devoid of a start up CD, and that's because Sony Ericsson has included the relevant software on the memory card. And for a phone that's supposed to be a media handset, SE has decided to give it a whopping 8GB card right out of the box, which we're very impressed with. But the thing we love the most is the MH100 Bluetooth headset, which houses a 3.5mm headphone jack to allow you to use your favourite cans wirelessly (well, sort of). This is a teeny tube with multiple LEDs on the front to show activity, with a touch sensitive slider on the side to control the volume. There are also track skipping and play/pause keys included, as well as a call/terminate button on the bottom, as the MH100 can also be used as a hands free kit. You may have noticed we nabbed this for use when reviewing the Satio - it's a great addition to the package and makes the Aino a much more attractive proposition in our eyes. The box also includes a charging stand - it allows you to watch movies without having to hold the phone, as well as including two charging ports so you can power up your phone and Bluetooth kit at the same time, which is another neat touch.